Stores across the N.W.T. are selling legal cannabis for the first time, and the demand is high: Yellowknife's liquor shop ran out of product by Wednesday evening, though another shipment is expected Thursday. Stores across the N.W.T. 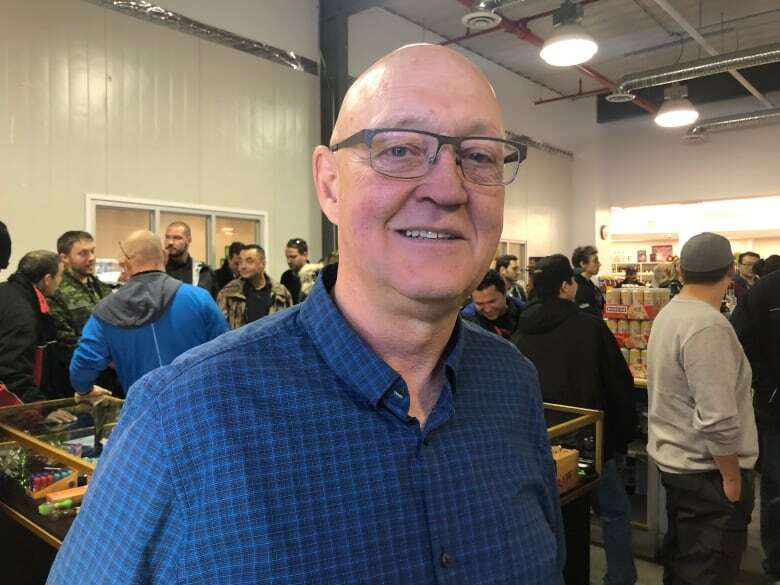 are selling legal cannabis for the first time, and the demand is high, with Yellowknife's only retail store running out of product by early Wednesday evening. Edward Eggenberger, the owner of The Liquor Shop uptown, says the store ran out of product at approximately 5:35 p.m. MT Wednesday evening, though it is expecting a new shipment Thursday morning. The Liquor Shop is the only physical place where people in Yellowknife can buy cannabis. 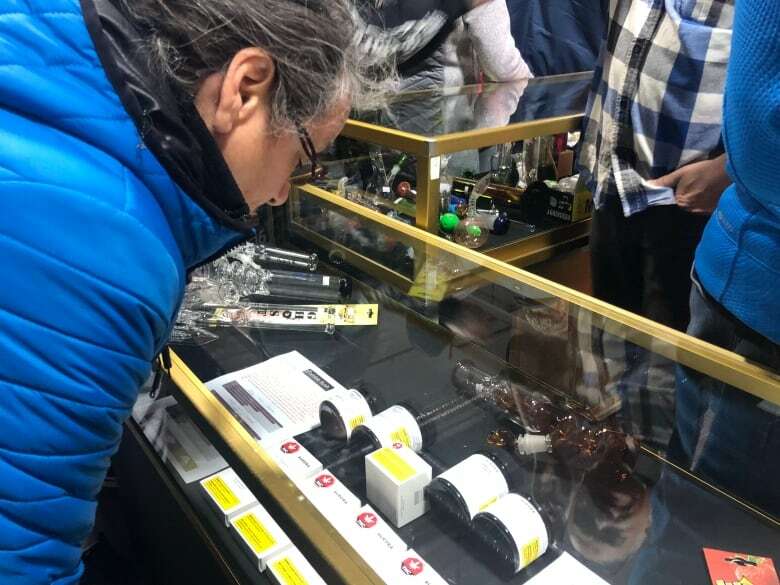 In the morning, crowds lined up outside the store — some as early as 6 a.m. — to buy legal cannabis. Opening at 11 a.m., the store had to close its doors around 11:30 in order to deal with the crowds. Once inside, customers had a chance to look at a variety of products lined up inside glass cases. "Everybody's happy to be here," said Eggenberger. "It's very busy. We're just trying to do the best we can at the tills to handle everybody." Eggenberger said there's been some issues with scanning the products and with labelling. "The product is not labelled that well, so it's hard picking the right product," he said. "It's trial and error. But I think everybody is going away happy." Eggenberger said the plan is to move the products to a cannabis-only store next door to the Liquor Shop within the month. "Absolutely it's a good day," he said. "It's become just another product that we sell. There's still a stigma attached to it, but the stigma is going to go away over time." "It'll be interesting," said Timothy Zoe-Martin, one of the many residents who stopped by the store Wednesday morning. "It'll be nice to smoke and not have to worry about getting in trouble." Zoe-Martin, who describes himself as a social smoker, said the day is important in reducing the stigma surrounding cannabis. "Nobody wants a criminal record," he said. "We all want to be able to hold down good jobs and do what we can, right? So for it to actually be legalized ... now I can walk around my neighbourhood and smoke a joint. "As long as there's no kids around, of course," he added. 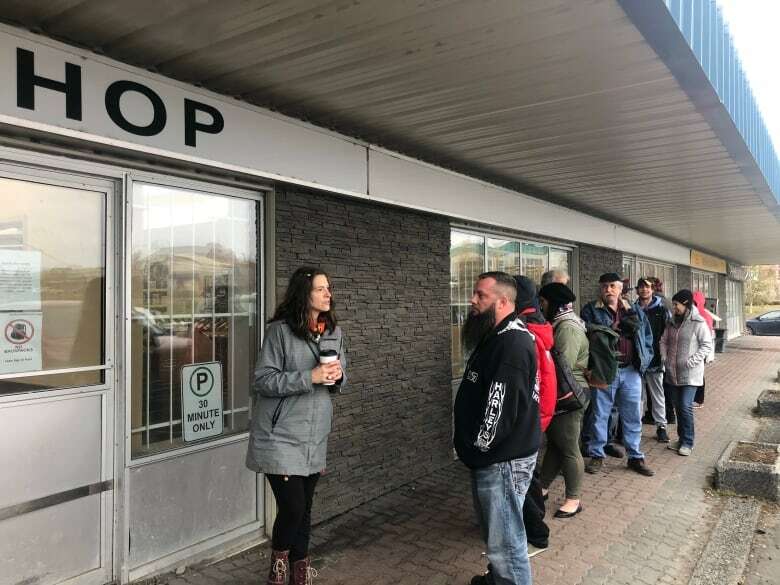 In the community of Norman Wells — with a population of about 800 — people can purchase cannabis products at the local liquor store as well. A small lineup began to form outside the store just before 4 p.m. on Wednesday when the store opened. It's located a five-minute walk away at the Northern Store, which also serves as the town's post office. People who purchased cannabis said they were excited about legalization. Robbie Greek said he hopes the products are good. "I'm pretty intrigued. It's Aurora [Cannabis] made right here in Canada — nice to support local," he said. "It's been growing underground; people have been having to hide it, be all sneaky and sketchy about it for years. Now they're going to have big legal grow-ops." Greek wore a "Norman Wells: Yes We Cannabis" T-shirt he had purchased inside the busy liquor store, describing his souvenir as "something to … commemorate the day." The store was selling a small run of the commemorative T-shirts, and by late afternoon it had run out of medium sizes. Roland Nadeau, from southern Alberta, said Wednesday was a "big day" for him. "I've been trying to get this legal since 1976," he said. "Used to go to pot rallies back then." 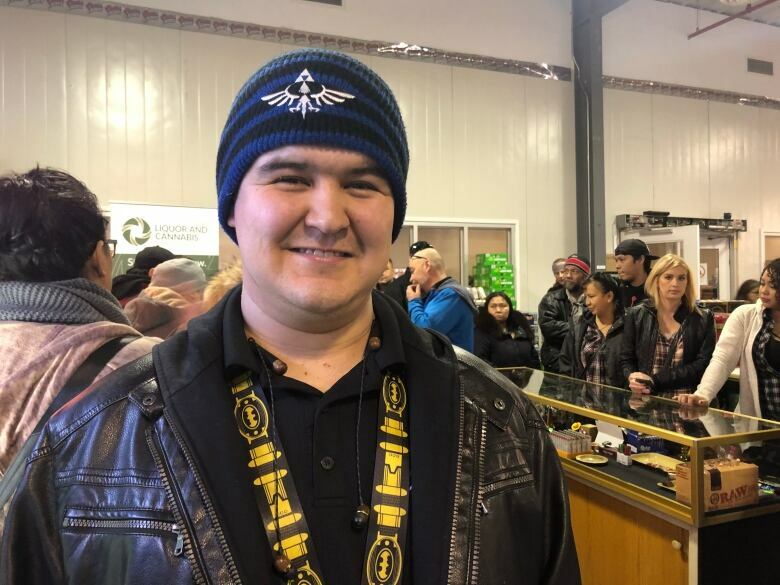 Joshua Brown of Yellowknife said he thought it would be better to buy cannabis from the store than from the illicit market. "For me, I'm just a recreational smoker," he said. "I'm hoping for good prices, good weed. There's no point in selling weed in the store if it's going to be the same as the street." 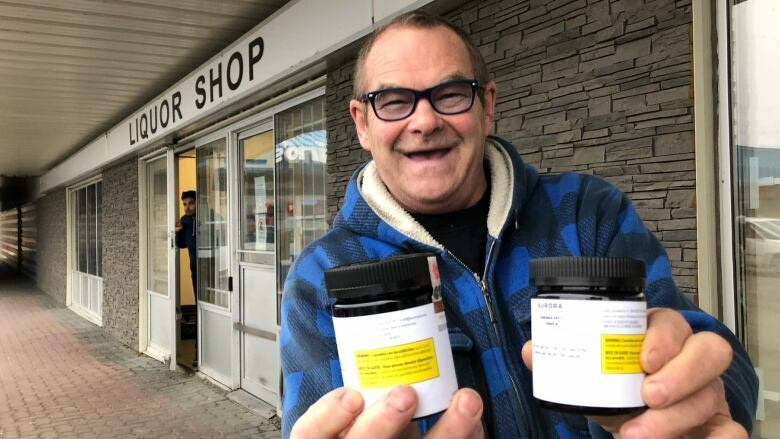 A liquor store employee in Norman Wells told CBC News they had yet to sell out of any cannabis products. Paziuk said she still isn't quite sure what the stigma around cannabis will be like, but said that she's prepared to keep an open mind. "It's going to be just like selling liquor I'm assuming," she said. Paziuk said the store made $5,000 in sales during their first two hours of business Wednesday. Fort Smith's liquor store is initially offering 10 products, but Paziuk said the store is expecting more variety in the future. Fort Smith's Colin Fradsham was one of the store's first customers, walking out of the store with a bong and some Zombie Kush. Referring to himself as an "in the closet smoker," Fradsham said he always told himself he would buy a bong on legalization day. "The selection in here was way more than I thought it would be," said Fradsham. "They've got not only your traditional bongs, pipes and marijuana selections but they have more traditional [selections] as well."